Renewing the levy (which has passed three times since 2003) is critical to help extend the school district's current operating budget to the year 2020. The operating budget includes teacher and staff salaries, benefits, maintenance and supplies, fuel, utilities, and instructional supplies. Passage of the renewal levy is crucial to maintain the current quality of teaching and continue to provide important educational opportunities for our students. Failure of this levy would require drastic cuts in personnel (salaries and benefits are 80% of the district’s operating budget) and programs. 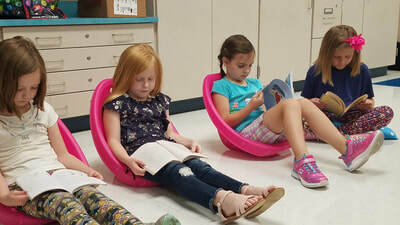 ​• Resources for addressing individual student learning needs. 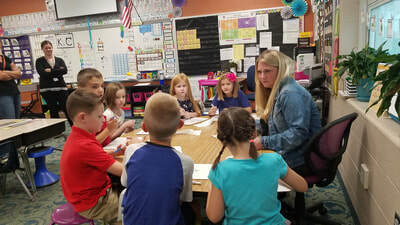 ​In 2004, as part of the Gemini Project, the Fairview Park City School District promised the community that no new operating money would be sought for five years. That promise has now been extended 14 years. Renewing Issue 5 on November 6th will extend the 2004 promise even further! 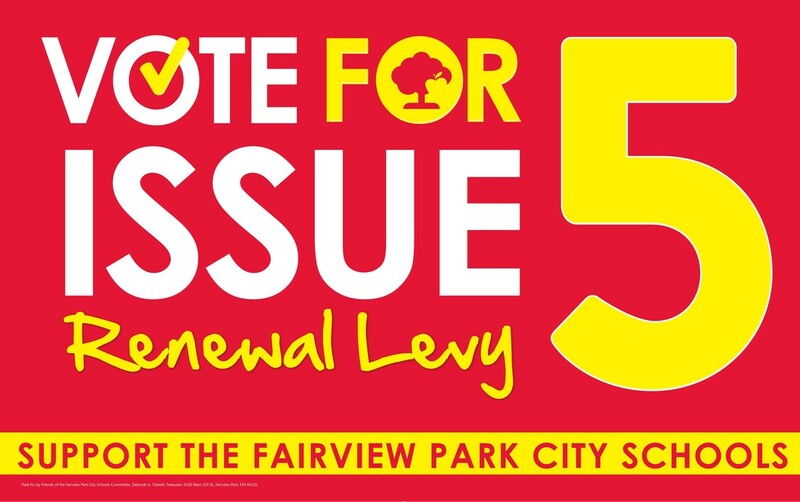 ​Shall a levy renewing an existing levy be imposed by the Fairview Park City School District for the purpose of providing for the emergency requirements of the School District in the sum of $2,690,000 and a levy of taxes to be made outside of the ten-mill limitation estimated by the County Fiscal Officer to average 7.5 mills for each one dollar of valuation, which amounts to 75 cents for each one hundred dollars of valuation, for a period of five years, commencing in 2018, first due in calendar year 2019? But wait... the ballot language says there is an emergency. What's going on? This term “Emergency” as used on the November ballot is a legal term defined by the state of Ohio. There is no actual emergency. “Emergency” levies raise a flat dollar amount (in this case $2.69 million) instead of a specific millage rate. Support Issue 5 by hosting a yard sign in your front yard. 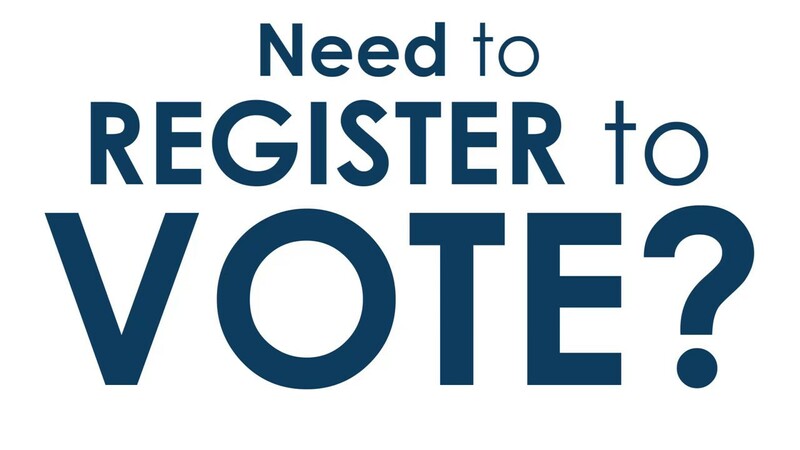 Yard signs will be available October 7th for pick up. ​We are on our 3rd generation to attend the Fairview Park City Schools. The school system has done an excellent job in keeping within budget. This renewal is necessary to continue a high level of educational services to our youth. This is only a renewal and will not increase taxes as the schools will not receive any more money than in the past. One can only look at the increases in sales prices of homes sold recently in Fairview Park. Families want to live in Fairview Park and the school system is part of the reason why. I am a parent of students that are 4th generation in our school district. I believe in our schools and more importantly in our community which is why we have chosen to continue to call Fairview Park home. Our district is not asking for new money but simply asking our community to reaffirm our support. Great improvements are happening in our school district which will allow us to provide for generations to come. We moved to Fairview Park in 2001. We thought we would live here for 5 years and then move to another suburb. Seventeen years later we are still in Fairview Park and the major reason is because of the schools. Our children have have attended Fairview Park City Schools since pre-K and are currently 7th graders. We have found the staff members to be supportive, professional and caring. Our children have benefited from small class sizes, personalized learning, a variety of curricular and extra-curricular opportunities and 1:1 technology. 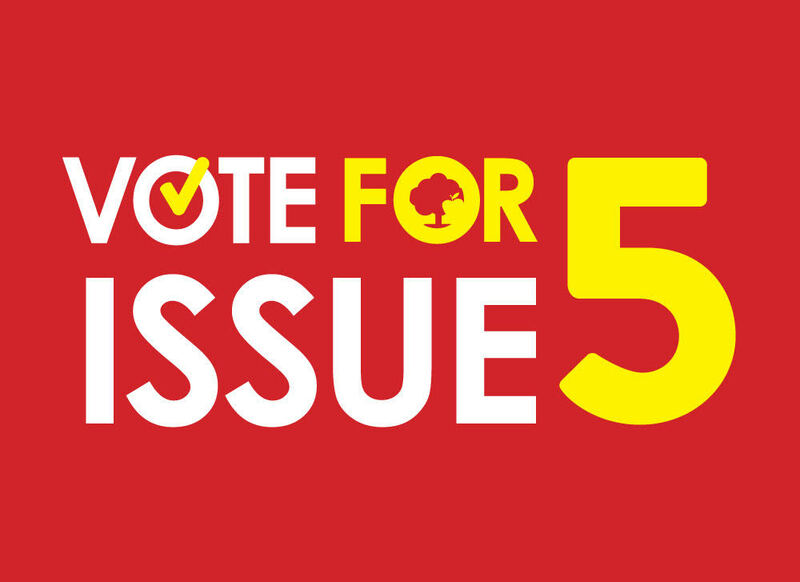 We feel the best way we can support our children and their future is by supporting our schools and that is why we will vote "Yes" for Issue 5. Supporting strong schools is not only vitally important to setting our students up for success but also for ensuring the long term strength of our Fairview Park community. DIDN’T THE DISTRICT JUST PASS A LEVY IN 2016? WHAT WAS THAT FOR? The 2016 levy was a bond and permanent improvement levy. These funds can ONLY be used for construction and renovation. The district construction project is underway with an anticipated completion date of spring 2020. This term “Emergency” as used on the November ballot is a legal term defined by the state of Ohio. There is no actual emergency. “Emergency” levies raise a flat dollar amount instead of a specific millage rate. HOW WILL RENEWAL OF THE OPERATING LEVY IMPACT MY PROPERTY TAXES? WHAT ABOUT THE REAPPRAISAL? Issue 5 is a renewal that will continue to generate $2.69 million districtwide. No more, no less. That means no new taxes for the district will be collected as a result of the renewal.